On 29 January 2014, the Maritime and Port Authority of Singapore (MPA) released a media statement about a collision between the departing Hong Kong-flagged chemical tanker, "Lime Galaxy" and the arriving China-flagged containership, "Feihe" in the evening at about 2.7 km, south of Jurong Island. The media statement reported that "Feihe" sustained damages on her bunker tanks, resulting in some spillage of bunker fuel. Oil spill response companies were activated to support in the clean up efforts. 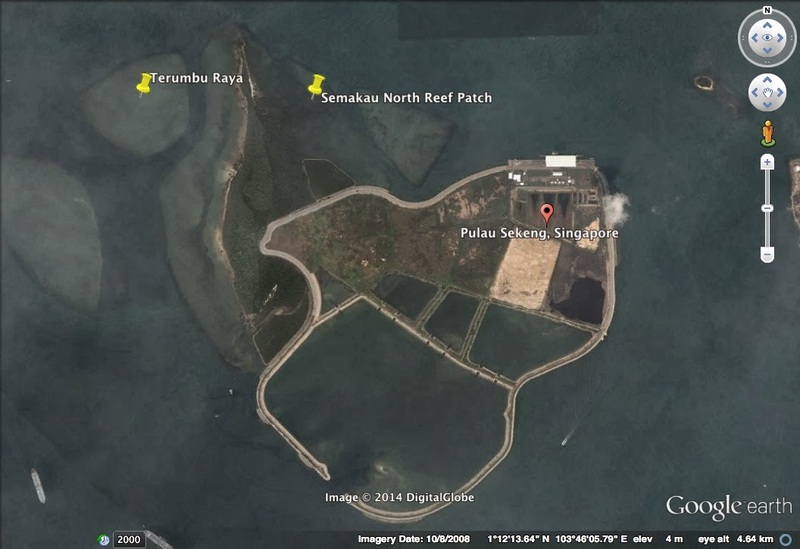 It is not revealed the exact location of the collision as Jurong Island is rather large but the image below shows the possible locations, mapped out by Ria Tan (wildsingapore). Possible locations of the collision, mapped by Ria Tan. It just so happened that within 12 hours, another collision took place 4 km off Marina South. Within short time frame of alerting friends about the oil spillage from the two collisions through social media, we have received news from friends that the oil spills had hit various locations in the southern islands. 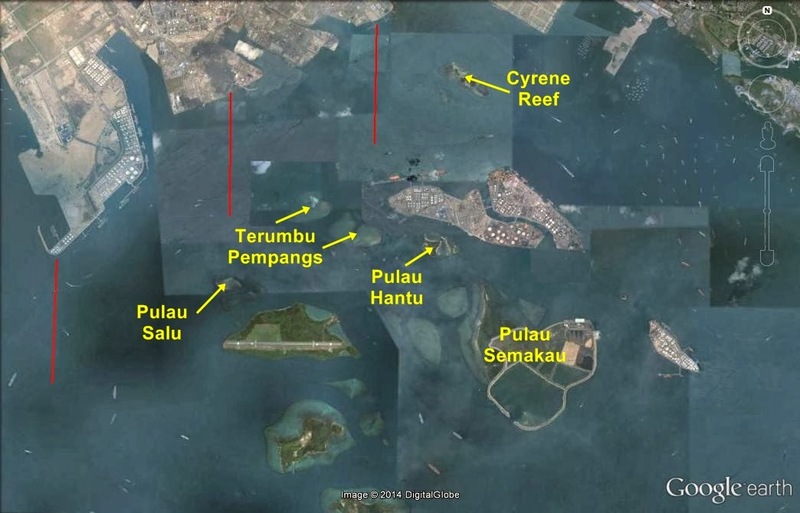 Locations such as Pulau Hantu, Pulau Semakau, Kusu Island and St. John's Island were surfaced. My post about the oil spill situation at Kusu Island can be found here. After the Kusu Island check, the few of us made a last minute decision to change the location for today's fieldtrip. The oil spill situation was much more important so other shores can still wait. We split up into two groups. One group heading for Pulau Semakau and the second group heading for Terumbu Raya, a submerged reef right next to the impact zone of Semakau. The good is that the Terumbu Raya team came back with good news of no signs of oil spill reaching the submerged reef and one of them even had three sightings of turtle surfacing. On the other hand, the Semakau team had some not so good news from the northern mangrove and reef patch. There were oil sheen and oil slicks noticed. Assessing the damaged done on the reef patch to the mangroves, the mangroves were reported to be hit worst. Northern mangrove and reef area. Along the red line, where the line of mangrove stops, was badly covered with oil. There was not enough time to do a comprehensive survey of the area coverage of mangrove trees being hit by the bunker oil. Oil marks on the sand, right in front of the mangrove line. Along the mangrove line, large amount of dying sargassum seaweed (Sargassum sp.) gathers on the shore as the sargassum season comes to an end. The moist look on the sargassum were not seawater but oil. The large clusters of sargassum seaweed were trapping oil. Excess oil flows onto the beach from the saturated sargassum seaweed, in negligible amount. The oil coverage on the blue drum indicates the oil being washed towards the mangrove. Sargassum seaweed covers the ground of the beach. with no sargassum seaweed to absorb the impact. Another Avicennia rumphiana, entangled with a mesh of sargassum seaweed soaked in oil. 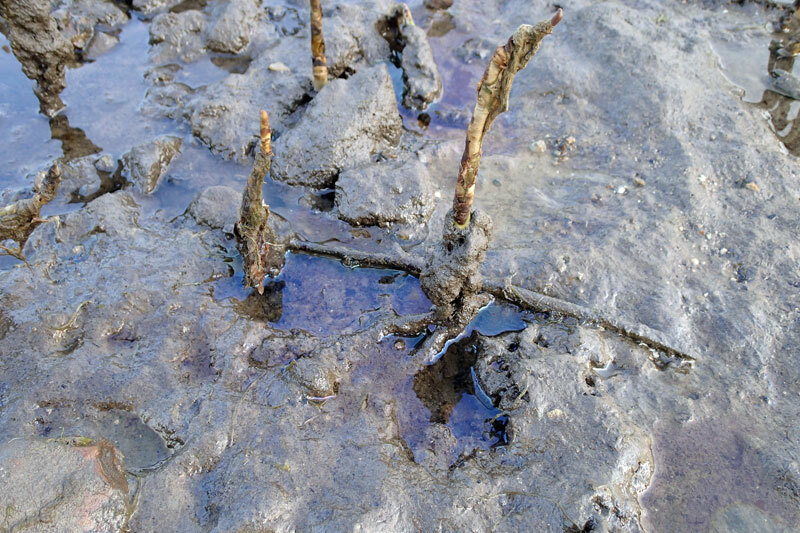 Mangrove, young or mature, with roots and leaves covered by oil. More images mangrove leaves and sargassum seaweed in oil. 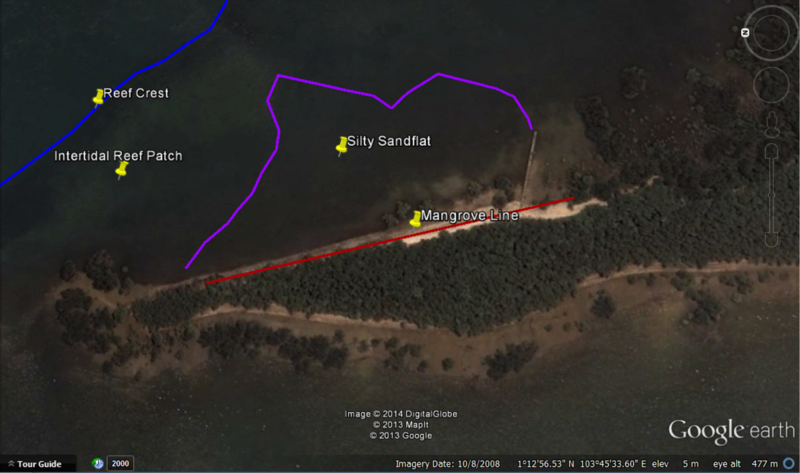 An overview of the mangrove from the beach clearly shows where the high water mark reaches in the mangrove at northern part of Semakau. Red line: Sargassum seaweed among the mangrove roots traps the oil as the tide receded. 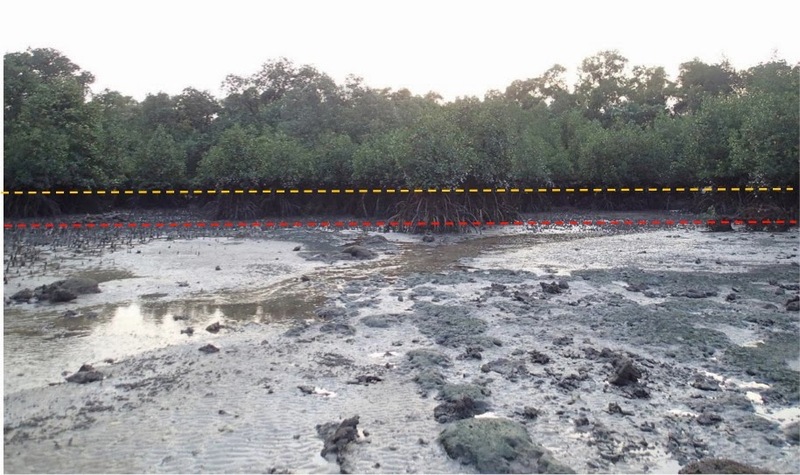 Yellow line: Level at which oil landed directly on mangroves. 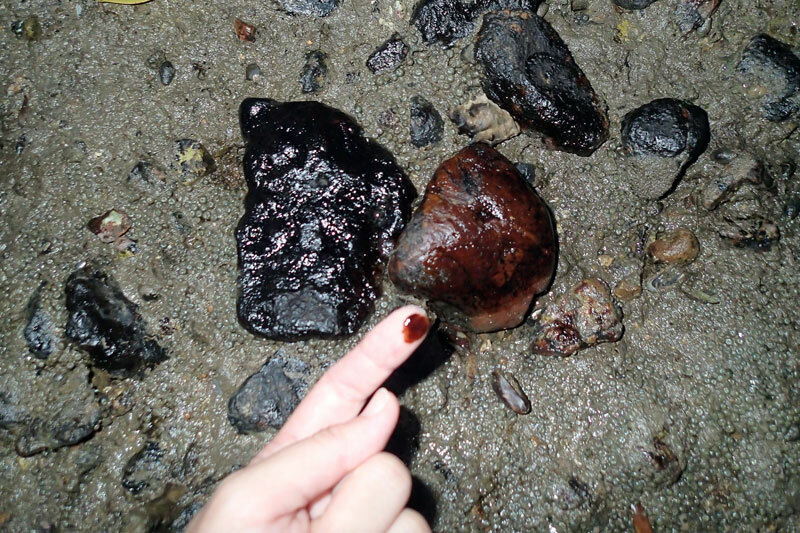 Some of the rocks at the northern tip of Semakau were coated with oil. Though the mangrove was impacted by the bunker oil spill, the sargassum seaweed seemed to provide some level of buffer and containment by acting like a 'sponge' in trapping the oil while the mangrove roots helps to trap the seaweed within the mangrove and beach area. The northern reef at Semakau had some what been protected by the mangrove indirectly. An oil spill accident in October 1997, resulting in 25 000 tonnes of oil spewed into the sea. Massive cleanup operation took place and it was helped by mangroves at Semakau as the oil gets accumulated on the tree trunks of the mangroves. Thus, the mangroves seemed to have helped in trapping and accumulating oil, preventing the oil in flowing back out as the tide recede and impacting the intertidal area. However, further investigation will be required to arrive at a conclusion. With the mangrove being covered with oil, it means that mangrove animals may be affected. A news article posted on mongabay.com recently shared about series of oil spills in the Caribbean, affecting many wildlife and the mangrove. While on the intertidal reef area, there were sparse patches of oil sheen on the water surface. These oil sheen are probably small amount of oil leaking from the mangrove and trapped sargassum. I did not come across any patch of oil slicks on the reef. 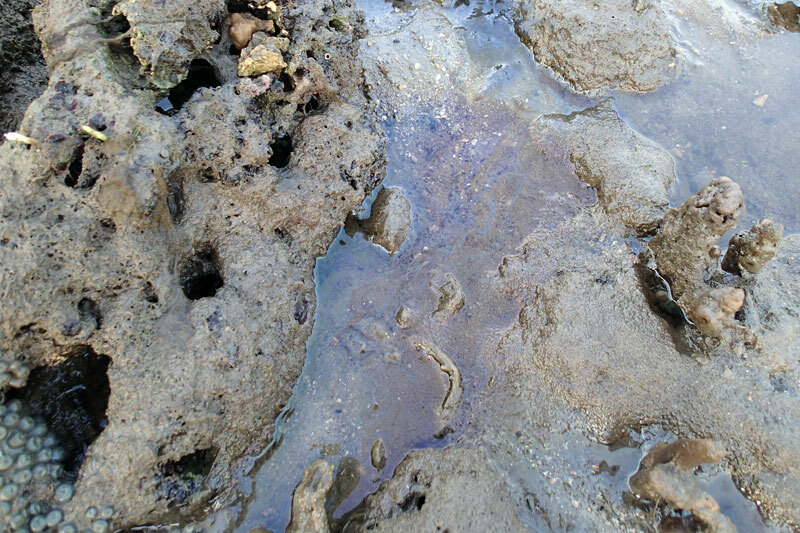 The following images shows oil sheen, in small patches, on the reef. Another patch on small pool. Here's the photo montage of the oil spill situation in Semakau.